Wow, what a busy few months we have had. Now the weather is changing I’m looking forward to seeing all of you looking sunkissed and healthy. A nice glow always makes you feel better! So first up………… CRUFTS!!!! Guess what?? A standard poodle won best in show and wasn’t he a beauty. I know you all know that Im partial to a poodle. He was something else. What a beautiful dog. Congratulations to Ricky. 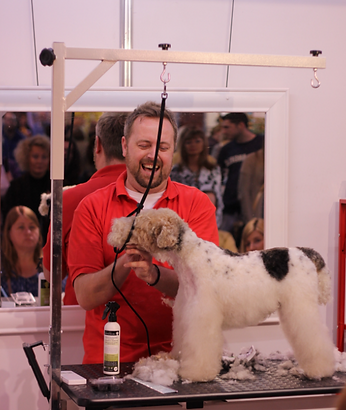 I was lucky enough to be demonstrating at Crufts this year for the English Groomers Group. What an experience. I met some lovely people and I groomed Teddy, Tia’s Wire Haired Fox Terrier and a standard poodle (See left photo). And some other news… “The British Dog Groomers’ Association is delighted to announce the appointment of Stuart Simons, as chair of the British Dog Groomers’ Association. Stuart is the owner and proprietor of Groom Dog City and has two salons in central London, one in Hoxton and the other in Victoria Park, both thriving up and coming areas. Stuart holds his City & Guilds Level 3 Diploma and is actively working towards membership of the Guilds of Master Groomers.Part of Stuart’s role will be to oversee the organisation of the 2014 British Dog Grooming Championship, which is taking place on Sunday 12 October at the Kennel Club Building, Stoneleigh Park. Nigel Baker, Chief Executive of the Pet Industry Federation said: ‘We are delighted that Stuart has agreed to take on the chairmanship of the British Dog Groomers’ Association. Stuart is a popular figure in the grooming world, and as a current member of the Grooming Committee has always brought innovative and refreshing ideas to each meeting, which he combines with a diplomatic and practical approach to problem solving. It is these qualities which will enable Stuart to successfully lead the British Dog Groomers’ Association into a new era. The PIF team and I look forward to working with Stuart on driving forward the British Dog Groomers’ Association’. Stuart takes over the chairmanship of the BDGA at an exciting time. The Federation has just launched a new range of member benefits, which offer BDGA members legal, HR, business and tax advice, as well as access to competitive specialist insurance rates to address the core risks faced by dog groomers in their work. The Federation is also in the process of recruiting new committee members and is developing the flagship British Dog Grooming Championship to ensure that it is truly representative of the grooming industry at large. Commenting on his appointment, Stuart said: ‘As a groomer and having started from scratch, I feel that I am in a great position to highlight what support we groomers need to help take our businesses to the next level. I want to bring the grooming community together and really focus on us all working as a team rather than against each other. I am thrilled to be leading the committee as I want our industry to be the best that it can possibly be and to have dog grooming seen publicly as the honed and developed skill that we already know it is’.